Chop peppers, onion, and steak into 1 inch pieces. Season steak with salt and pepper. In a large sauce pan or cast iron skillet, heat olive oil over medium heat and sear steak pieces until slightly pink. Remove steak pieces and set aside, leaving remnant oil in the pan. Return pan to medium heat, add garlic and Chocolate Shop and reduce liquid by half. Remove from heat and add peppers, onions, and steak back to pan, mixing until coated. 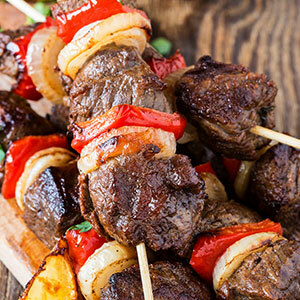 Skewer steak and veggies, alternating, and place on baking sheet and save remaining sauce in pan for dipping. Bake at 400° F for 10 minutes. Alternatively, you can skip the oven and continue sautéing steak and veggies on stove until fully cooked.